Listening to a talk radio show one day, the two hosts brought up an interesting story which I thought I could use for my blog. The example they used were cigarette smokers and how they got screwed by over-regulation. Back then when cigarettes first came out, people would smoke in restaurants, people didn’t care because that was just the norm. Any smoker knows that it’s just right to smoke a cigarette right after a filling meal. Then regulation came in. Regulation started to say to the smokers that they had to start smoking in a separated area called a “smoking section,” which the smokers gladly complied. Then regulation said they would get rid of the smoking section. Smokers would now have to leave their seats and smoke at the bar or patio, which again the smokers complied. Then regulation said they could no longer smoke indoors. They would have to step outside the restaurant and to enjoy their cigarettes, which again, the smokers did not complain and followed. Nowadays, you have to step AWAY, FAR AWAY from the restaurant and walk in dangerous alleys or blind spots to enjoy a cigarette. What happened to the smokers? They caved in to regulation. This is why the NRA (National Rifle Association) won’t budge to gun control laws. They know what happens once you give in to regulation. So this got me thinking, what if the same plan was in place for vapers? 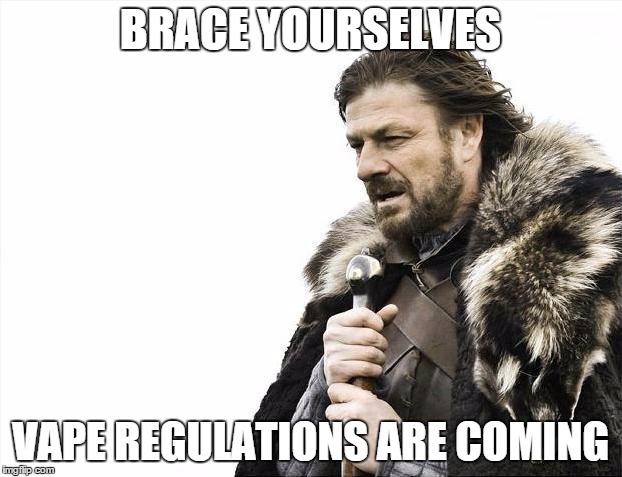 What if this so-called regulation was just a guise to dismantle vaping little by little. Are these regulations really for the good of society? Does the non-vaping society even care? Do you see mods blowing up in people faces on a regular basis? Do you hear of houses being burned to the ground because of faulty mods? Do we experience these kind of problems in the vaping community? Do we really need regulation? I don’t think so. I think we are fine with the way things are for vaping. What are your thoughts on vaping regulations?